Eccentric Bridesmaid Pre-Wedding Photoshoot at The Taj Mahal Hotel, New Delhi! Blogger-in-chief at GuiltyBytes and bride-to-be Devina Malhotra recently floored us with her rendition of an ideal pre-wedding shoot. No, no – it’s not what you think it is. It wasn’t filled with multiple picturesque locations an romantic poses that could give the suraj hua madham music vid a run for its money. Instead, Devina went the Carrie Bradshaw way and engaged in a tryst with her bridesmaids at The Taj Mahal Hotel, New Delhi! Pastels lehengas by Ritu Kumar, minimal makeup contrasted with bold lips by F Salon and whole lotta girl love was seen in their photoshoot brilliantly captured by Megha of Sunflare Art House. The Taj Mahal Hotel, New Delhi played a perfect setting for Devina and her girls in making mark on the Indian wedding scene with their off-beat pre-wedding shoot idea. Understated elegance with a touch of the whimsical was this gorgeous bride’s goal, and what a way did Riveting Events achieve it! The Taj Mahal Hotel was spruced up with Mughal-like pillars and arches beautifully perched with fresh roses and carnations and the chandeliers at Longchamp, The Taj Mahal Hotel’s premium rooftop venue only added to the pretty of this beautiful pre-wedding photoshoot location! This bridal shoot was glammed up by the cute bridesmaid favors by Zariin Jewelry which Devina handed to them as an invitation to this shoot. She put together their extraordinary Pearl Kissed Redux goodies and charms along with a cute note, thanking them for helping her tie the knot. 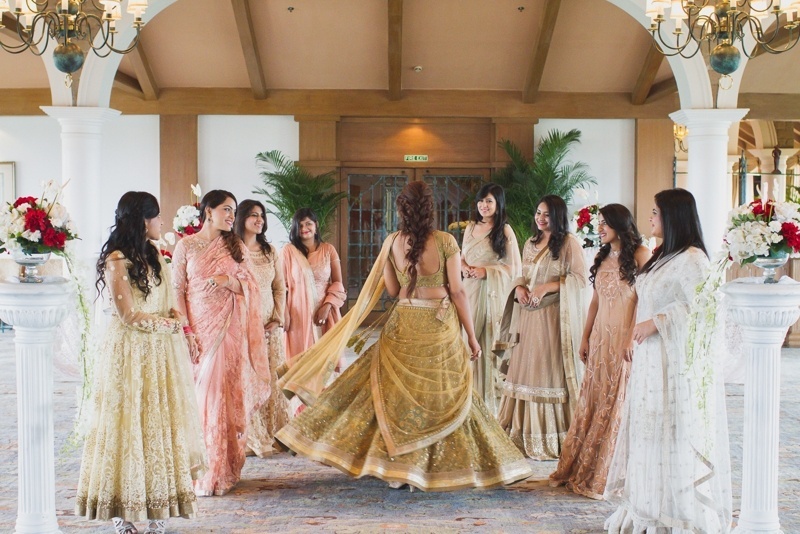 All the girls wore Ritu Kumar lehengas, anarkalis and sarees in pastel ones of peach, pink, dull gold and white while Devina picked an ochre and gold lehenga with pretty crystal and sequinned embellishments that went beautifully with the Rusaru clutches that the girls held. Twirling and laughing, all the details of the clothes as well as those candid moments were perfectly shot by Megha of Sunflare Art House in all its beauty. So, what do you think? Would you try something so quirky-unique-trendsetting with your girls too?! Let us know in the comments below! Read more on Bridesmaids here! Quirky and Fun Bachelorette Party Invitation Ideas!